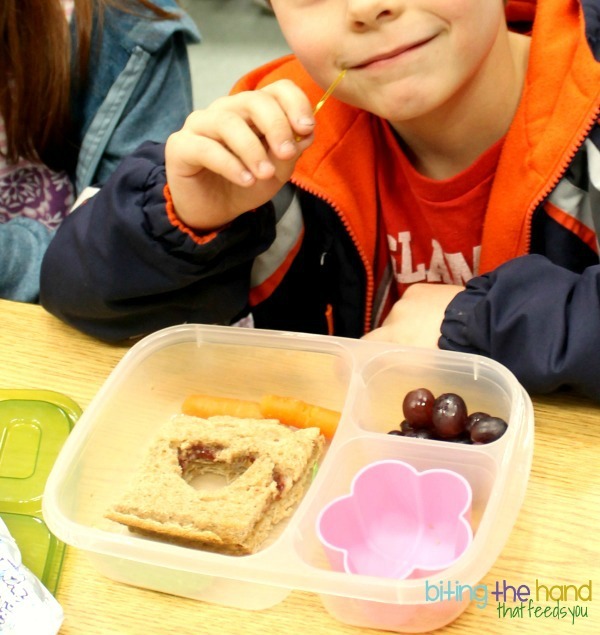 Biting The Hand That Feeds You: Packing Healthy Lunches With (the) Class! 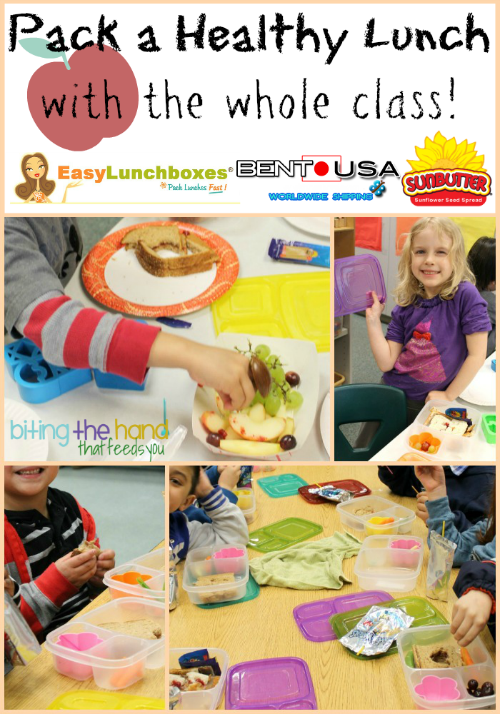 Packing Healthy Lunches With (the) Class! 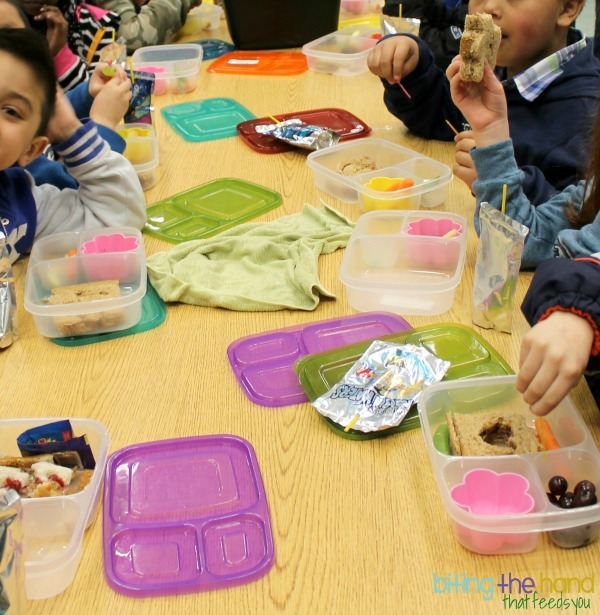 Healthy fun school lunches for the entire Kindergarten classroom! 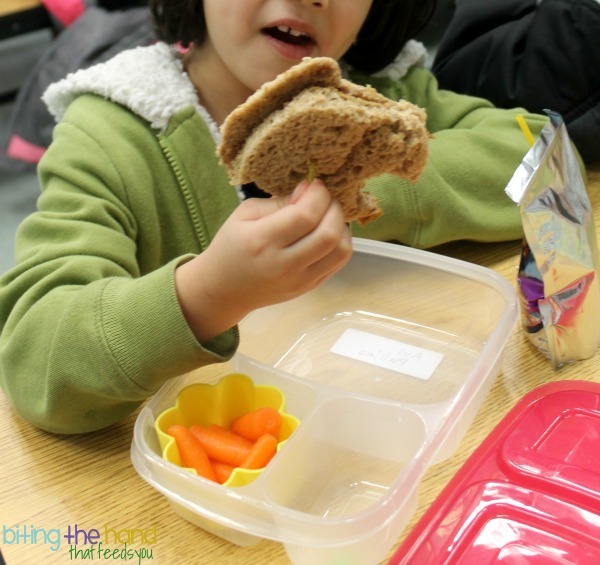 Z's Kindergarten class was doing their Nutrition unit, so I volunteered to come in at the end and bring my sandwich cutters and run a fun "Pack a Healthy Lunch" activity with all the kids. But with the help of EasyLunchboxes, AllThingsForSale, and SunButter, it evolved into something even more fun! Z's classroom has 25 kids and 6 tables, so we set up enough "supplies" for 4 kids per table, and I had Z's gluten-free bread waiting to go to whichever table she chose. 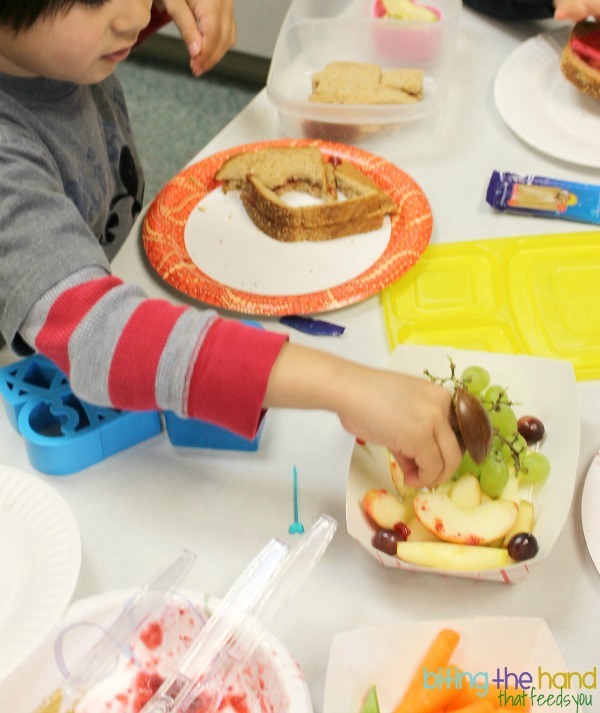 Since the new MyPlate food groups are Grains, Protein, Fruits, and Vegetables, I made sure to include something from each of those for the kids to work with. The teacher also taught them about "Sometimes Foods," so we had a special treat of juice (Capri Suns) instead of water or milk. Protein: Since a few of her friends have peanut and tree nut allergies, it's a nut-free classroom. I opted to contact SunButter as they're my personal favorite nut-free spread. They ended up sending more than just some Sunbutter packets for the kids - I got a whole load of goodies to pass out at the end! Want to spread the sunshine to your kid's school? Email them at info@sunbutter.com! Fruits: I wanted the kids to have some amount of choice (other than which sandwich cutter they were going to use!) so I brought both grapes and sliced apples. I went the lazy route and bought pre-sliced apples. Veggies: I went with baby carrots for the kids, and decided to introduce one of our favorites that they might not have tried yet, sugar snap peas. Other than Z, I don't think any of the other kids had had them before. When telling the kids about them, I mentioned that they were regular peas that they were familiar with, but still inside the pod. Which was edible. Like getting to eat the wrapper! Fun! I was so busy helping open Sunbutter packets and pressing and twisting cutters to help punch through the sandwiches that I didn't get very many pictures at all though. Waaaah! 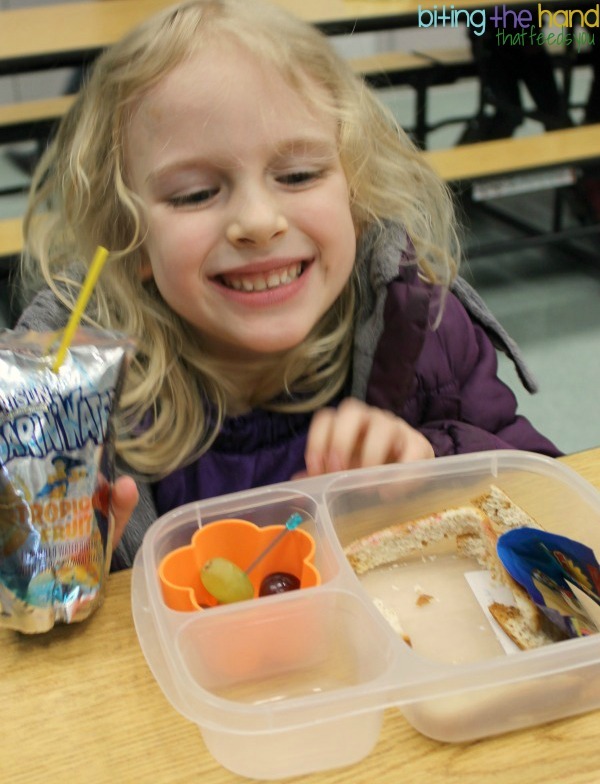 After loading all my tools and leftovers back into the car, I got to go to the lunchroom and take pictures of the kids enjoying what was left of their lunches. My inner perfectionist was going bonkers with all the mangled sandwiches [for best results cut the bread separately first, or at least cut the top slice before moving it onto the rest of the sandwich and punching through the bottom] but the kids were all so pleased with their fun sandwiches! I was worried that there would be some resistance to the different flavor of the Sunbutter, but other than the two kids who didn't like peanut butter anyway and opted to just make jelly sandwiches, all the kids gobbled down their sandwiches. Even mine, who has always groused when I use the "funny peanut butter" when packing things for her previous nut-free schools. Omnomnom! 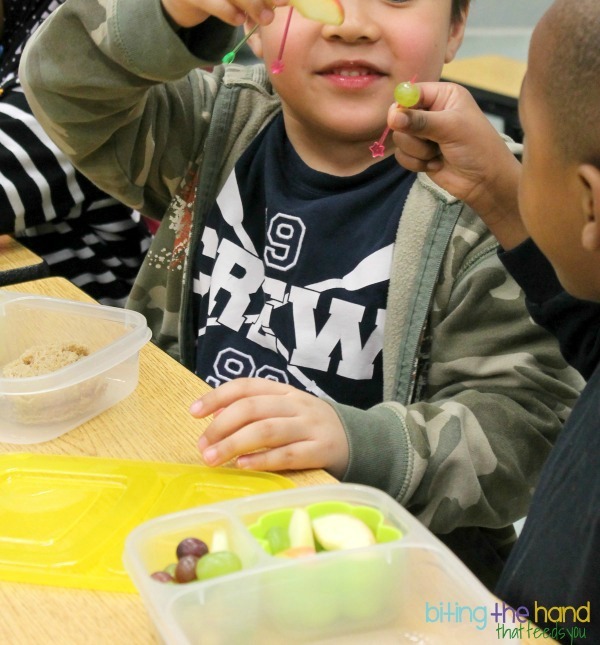 With a few exceptions, all the kids tried at least one sugar snap pea in their lunch, and several of them really liked them and wanted more! And from the few times I've observed these kids at lunch, I've never seen the food disappear so fast (or seen so few leftovers!) Big Mama win! Even my own little monkey ate more of her lunch than usual. Including her veggies! Great idea for a classroom event! That's awesome! Look at their faces! Suuuuper fun!!! Now this is learning! We're so proud you let us help you, and we love the photos! Way to go on sharing your patience, enthusiasm, energy and of course teaching skills. Bet these lucky kiddos don't even know all they learned from you. Way to go!